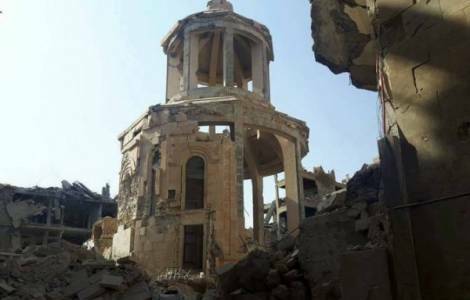 Damascus (Agenzia Fides) - Syrian President Bashar al Assad has pledged to rebuild with state funding the church-sanctuary of the Armenian martyrs located in the Syrian city of Deir ez-Zor, which was devastated by the jihadists of the Islamic State (Daesh ) in September 2014 (see Fides, 22/9/2014). The intention to revive the shrine dedicated to the victims of the Armenian Genocide from its rubble - refer Armenian sources such as Armenpress, and also channel Ishtar TV - was expressed by the Syrian President during a recent meeting with a delegation of Armenian businessmen visiting Syria, led by George Parseghian, President of the representative committee of Armenian Syrians in Armenia. In September 2014, as reported then by Fides (see Fides 22/9/2014), the jihadists of Daesh conquered about half of the urban area of Deir ez-Zor, an eastern Syrian city with a Kurdish majority, and a few days later destroyed the church where the remains of the victims of the Armenian Genocide were kept. The church was consecrated in 1991 as a memorial of the Genocide and also included a museum with the remains of the victims of the massacres suffered by the Armenians in Ottoman territory between 1915 and 1916, which had recorded a particular concentration in the desert area around Deir ez-Zor. In the governorate of Deir el-Zor the jihadists killed hundreds of members belonging to the local tribal clan and in previous months also fought with the Islamist militiamen of the al-Nusra rival faction to gain control of the area, rich in oil. The city was reconquered by the Syrian government army in November 2017, but jihadist groups still continue to carry out targeted attacks in the surrounding areas.